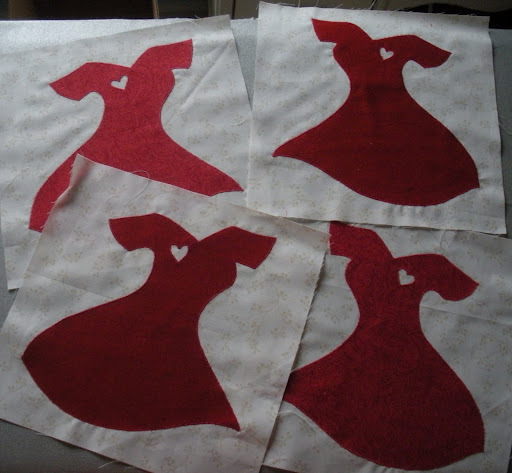 These dresses will be the four cornerstone blocks in a sampler quilt with applique borders. 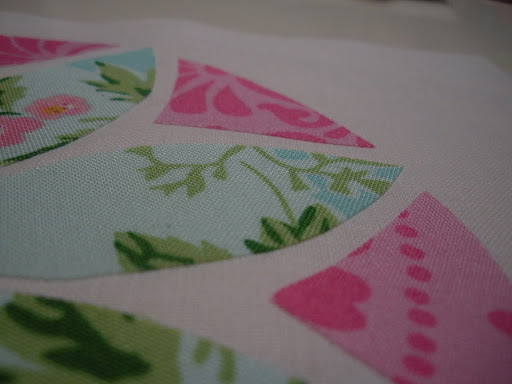 I did fusible applique with a small zig-zag stitch to finish the edges. I also got a good start on my Sis Boom Pow! 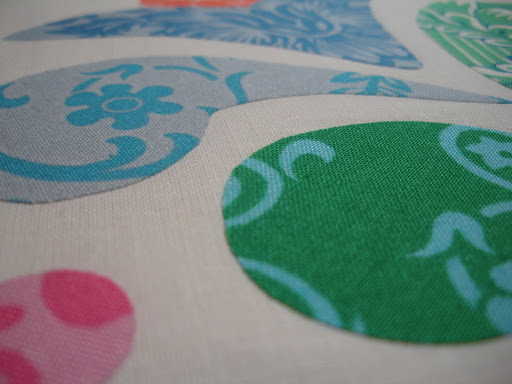 applique blocks…only sneak peeks at this point, they are still works in progress! These Jennifer Paganelli fabrics are to die for! She donated the fabrics to us (30 internet-connected quilters across the globe) to create blocks to go into a quilt that will be auctioned for charity. 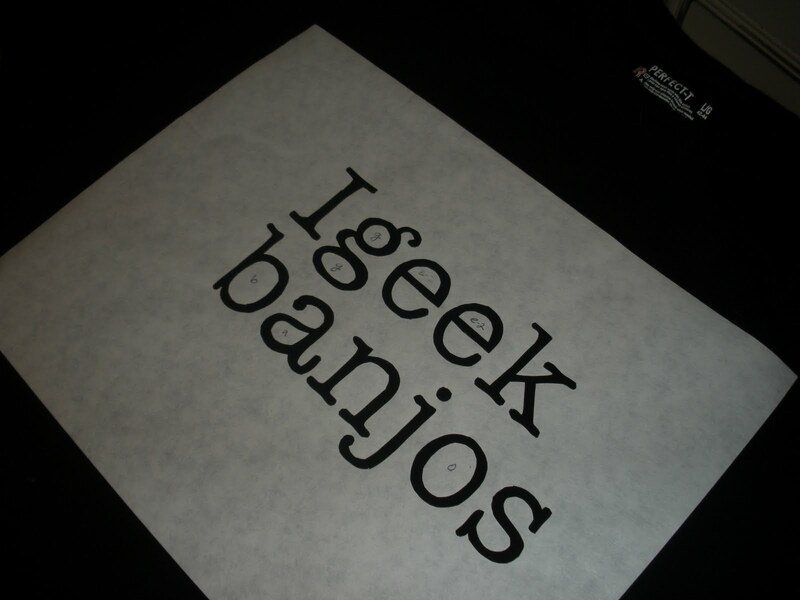 For my non-United States visitors, I should explain the phrase, “I geek banjos”. There is currently a nationwide advertising campaign going on to promote using your library. You can check out the link here. There are billboards, bumper stickers for your car, t-shirts you can custom order, and a website to share what you research or read (i.e. “geek”) at the library. The T-shirt above is for a certain guitar player who recently bought a banjo, just for fun, and is now obsessed with all things banjo. You can custom order t-shirts with you own phrase, for example…”I geek quilting”, “I geek crafts”, “I geek fly fishing”, “I geek literature”…you name it, but the custom shirts are $30+ dollars, a little spendy for this gal. I remember as a kid, being at a department store or the mall with my mom and wanting something, and she would say something like, “$17.00?!? That’s ridiculous! I could make it for half that!” and we would leave empty handed. Sometimes, she made a facsimile of the item desired, sometimes she wouldn’t get around to making it and I’d put it out of my mind. As a kid, I always just wished we could buy the one already made. Now I appreciate everything handmade I ever had…and I am now SO my mother’s daughter…! Love those swingy red dresses! They're just as cute as can be! Good on ya for making them to donate for a worthwhile cause. I totally relate to your mom story. Ditto! Mother could copy an outfit to the smallest detail – much higher quality and at half the price. When wearing it I was proud to brag, “My mother made it.” Then in no time, the inevitable ooohs of appreciation followed. I'd like to think I'm like her, though I never quite achieved her skill level. But I've retained my ability to say, “I made it myself!” Cheers to moms like ours! 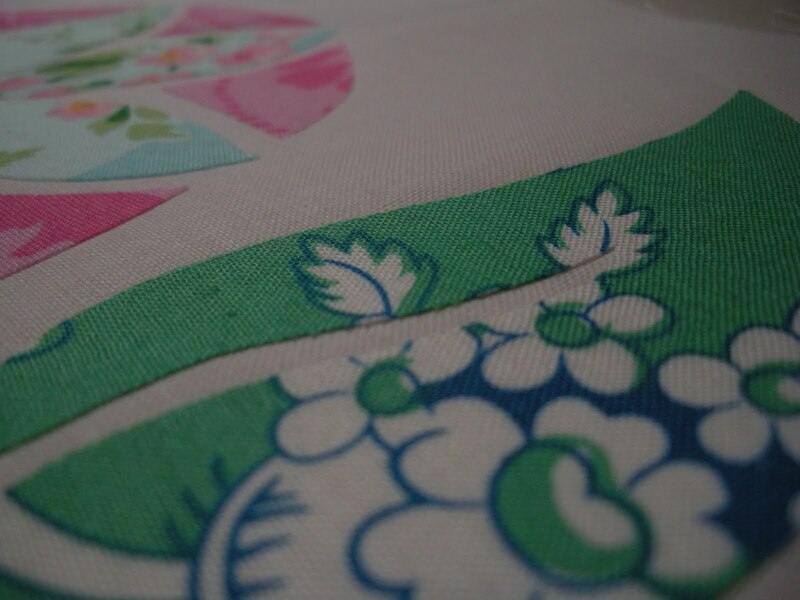 like those sneak peaks at the JP sis boom fabric blocks!! those swing-y dresses! how great are they! how exciting! love all this work! Well now, you have had quite a productive week. I have never seen a star within a star block – that is very cool! And I haven't heard of this Sis Boom Pow, that looks cool too. Lots of good things going on with you these days! Wow how did you create the star with-in a star block? Love the dresses and I'm looking forward to seeing your blocks for the Sis Boom Pow. Still working on mine. 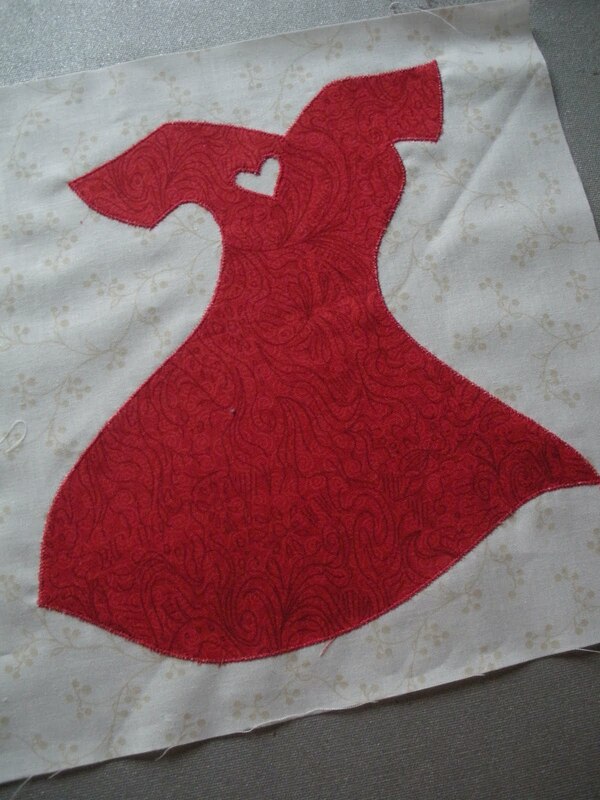 Love the red dress quilt blocks! Just fabulous! The “I geek” phenomenon must not be country-wide, or maybe it just hasn't reached the NW. I haven't heard of it. Love the red dresses and I'm a huge Sis Boom fan! But the star-in-star and the geek thing is new to me. Interesting! Due to my mom I was always the first one in my tiny school to have the latest fashions. I made a ton of things for my girls, too. Like Linda said, “I made it myself!” is a good feeling. You're so busy…don't know how you do it! The shape of those red dresses is too sweet for words. They look like they're ready to hop up on their own & twirl around. 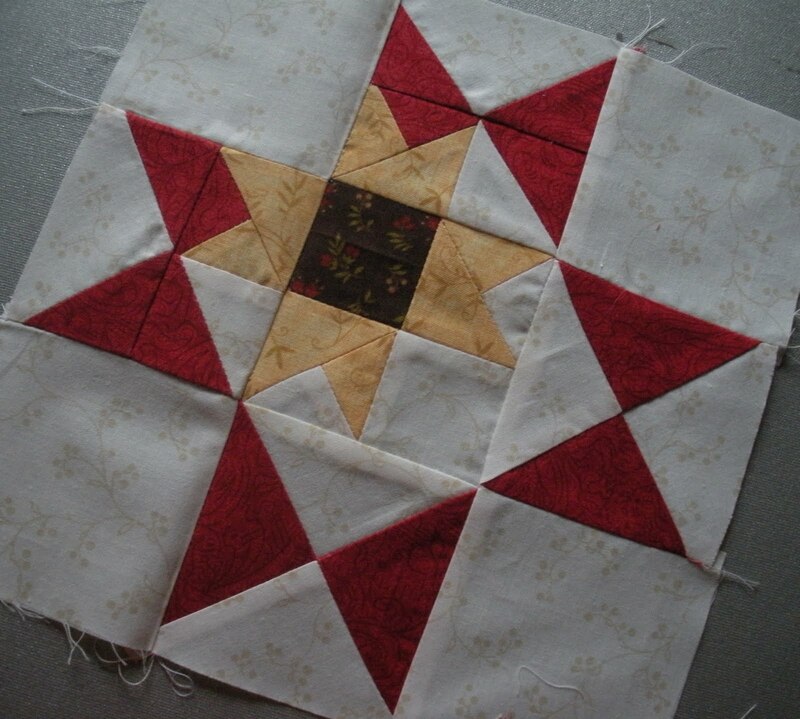 Your star-in-a-star block is going to be a great addition to the sampler quilt. You've been a busy, busy lady. I can relate to your “I can make that” story, too. Way to go crafters!